Green Bambu Series - Large Shadow by Bdellium tools. The brush was designed for applying any kind of shdaows. Perfectly grins lines of different colors and facilitates precise application. 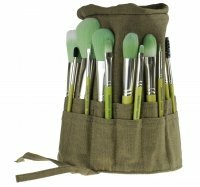 The brush was made of synthetic bristles in light green color. Natural bamboo handle, characterized by exceptional hardness, solidity and precision of execution. Circular lacquered handle, does not slip from the hand while working. The hair was arranged in a metal, slightly flattened cap.